The Holy Land had seen its last and truly unsuccessful Crusade in 1291. The last of the Christian soldiers withdrew from Nazareth the same year leaving behind the holiest of houses — unprotected. It was to be dealt with according to the Moslem tradition of pillaging and destruction. It may seem farfetched to think that a tiny clay house venerated by a handful of Christians could merit such vindictive rage. But this was a unique house — visibly an edifice of mud and straw but preserving within its framework living memories of its Royal Household — Jesus, Mary and Joseph. At any rate the first assault was begun by the Seljukian Turks in 1090. They savagely raged through the Holy Land looting the treasures left in churches by devout pilgrims. They turned Basilicas and churches into mosques and destroyed what was deemed useless for their unholy purposes. Among the last class fell the fate of Santa Casa, home of the Holy Family. Fortunately when Constantine had the first Basilica built over the holy spot in 312 — the house along with the grotto that was attached was interred within a subterranean crypt. And it survived the desecration. In the years that followed, a trickle of Christian pilgrims kept alive devotion and veneration to the Holy House where the Word was made flesh. Then when the first Crusaders arrived victoriously in 1100 under Tancred, they built a new Basilica. During the relative peace that ensued pilgrims once again freely visited the sanctified ground. But because of the unholy motives that drew some crusaders to the Holy Land God did not bless all their attempts to secure lasting peace and it resulted in spasmodic victories overshadowed by powerful defeats. In all there were eight crusades. In 1219 Saint Francis of Assisi whose spiritual sons now have charge of the Holy House visited the “Holiest spot on Earth” in Nazareth. During the last crusade Saint Louis IX, King of France knelt on the ground that had once been frequented by Our Lord and received Him into his heart in Holy Communion. The year 1263 saw the second destruction of the Basilica but again the Holy House endured victoriously the assaults of the Infidels. But defeated Christians withdrew in 1291. Total destruction finally loomed over the former home of the Holy Family as free reign was given in the Holy place to its unholy inhabitants. Eternal Wisdom, however, had other plans! 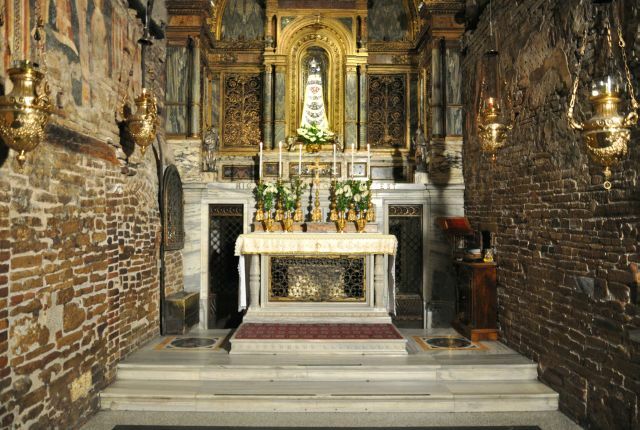 The undaunted investigators, at any rate, discovered that this “chapel” contained an ancient altar, a beautiful statue of the “Holy Mother of God” and a cross bearing her crucified Child. Realizing it was no ordinary incident, the shepherds ran off to the local church of Saint George to awaken Father Alexander Georgevich. The puzzled priest, after investigating the clay “church” himself, could offer little explanation to the humble crowd that gathered. That night the weary old prelate, although severely crippled with arthritis, spent hours in prayer beseeching enlightenment from the “Virgin Most Powerful.” In his sleep the “Mother of Good Counsel” rewarded his humility by answering his request in a dream. The next day the sudden disappearance of Father Georgevich’s familiar malady was quite obvious. He then announced that it was she, who is called “Health of the Sick” who had cured him and related the vision of the night before. The peasants of Tersatto now knew for sure that this was the sacred little home of their Savior. They venerated it accordingly. Across the sea in Italy a little plain called Banderuolo, four miles from the city of Lecanati welcomed the Holy House when the angels lowered its uneven walls onto the wooded area. It took almost no time for people to hear of the arrival of this strange airborne house. Thousands of people began to make pilgrimages to it and it rapidly gained a reputation as a place of cures. But unfortunately as the pilgrims increased, so did the bandits that lurked in the surrounding forest. Slowly the house of prayer became surrounded by a den of thieves. Feeling the same justified anger that once compelled Him to cast the buyers and sellers from His Father’s House, Our Lord withdrew the House itself! Once again the soft flutter of angel’s wings stirred the night air as they relocated the home of the “House of Gold.” This time its foundationless walls settled down on the Antici property in Lecanati. Tradition tells us, not long after this that the two brothers who owned the property took to fighting. The cause of the riff was probably over the Holy House itself, each claiming to own the plot it occupied or perhaps taking credit for its having chosen the land because of their personal holiness! Tradition calls it a quarrel, but it must have been quite brutal to have caused the “Refuge of Sinners” to abandon the site. At any rate as soon as the Santa Casa moved — the brothers reconciled. The Holy House now reached its final destination — final, that is, at least to this present date — on Loreto hill — a few miles away from its previous location. Although they weren’t quite sure just what was the story behind it, people began to come in droves to venerate it. In 1295 a strong wall was built around it either for protection or to keep it from escaping their humble grasps and making another nightly excursion! Identification of her sweet little home was clearly unfolded by the “Virgins of Virgins” herself in 1296 to a saintly hermit who lived nearby. Immediately the government of Lecanati sent sixteen of its most reputable citizens to Palestine to investigate the situation. After an absence of months the retinue of homespun scientists returned with the obvious facts. All they found in Nazareth was the spot, still venerated, where the house once stood. The foundation measured up exactly to that of the house of Loreto: thirteen feet by thirty one. The bricks of the local Nazareth habitation were of the same substance as the Holy House, whereas the other Lecanati abodes were completely dissimilar. The Lecanati representatives were convinced — this was the house of the Holy Family, miraculously brought to the shores of Italy through the Will of God and for His Glory. Since then, it has become the greatest shrine to Our Lady in the world, ranking even greater than Mary Major in Rome. 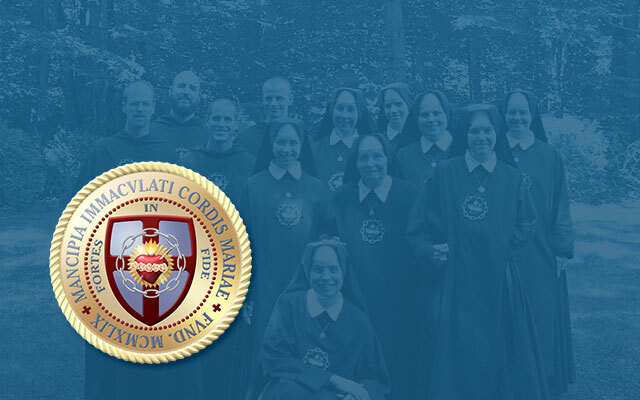 Over 2,000 canonized, beatified and venerable children of the Church have paid homage to the “Singular Vessel of Devotion” by visiting the home in which she was born, and raised the Son of God. These include: St. Ignatius Loyola, St. Francis Xavier, St. John Berchmans, St. Philip Neri, St. Francis de Sales, St. John Capistrano, St. Clement Hofbauer, St. Alphonsus de Liguori, St. Louis de Montfort, St. Benedict Joseph Labre, St. John Neumann, St. John Bosco, St. Therese, Blessed Maximilian Kolbe, Mother Cabrini — just to mention a few. More than fifty Popes have issued Bulls and briefs testifying to its authenticity. Hundreds of Papal documents have granted it privileges, exemptions and authorizations to receive benefits, etc. In 1669 it was given a Mass of its own in the Missal. One of the five litanies approved for public recitation is called after it, the Litany of Loreto. It is a place of many miracles. Those who have come throughout the ages, beseeching aid from the “Comforter of the Afflicted” usually return home spiritually aided or physically cured. Three successors to the chair of Peter have physically experienced the benevolence of the “Virgin Most Merciful” and were restored to health. They were Pope Pius II, Pope Paul II and Pope Pius IX. Even today cures continue, for Our Lady still exercises her Queenship by interceding for her subjects who implore her aid under the title of Our Lady of Loreto. Sweet were the days she spent in the little home with Saint Joseph and the Holy Child. Their life within the clay walls was affluent with poverty, resonant with silence and illustrious in humility. Our Lady of Loreto pray for us!